We think of them as scientists, but they more resemble backpackers, sometimes traveling more than thirty-five miles a day on foot in search of rare plants and exotic creatures. Explorers of a different kind, they sought distant lands writ small, in the articulation of a leaf or the coloration of a newfound bird. John Clayton and Johannes Fredericus Gronovius. Flora Virginica. 2nd ed. Lugduni Batavorum, 1762. Shown: Title page. Immortalized in the genus name of the Spring Beauty (Claytonia virginica), John Clayton was one of the most active plant collectors in the colonies during the eighteenth century. 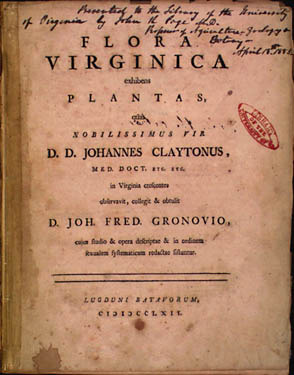 Though he left no accounts of his travel over the Blue Ridge into the Shenandoah Valley, at least one such voyage is certain, due to his statement in the Flora Virginica (2nd ed., shown here) that he brought back Napaea dioica, the glade mallow, "only from the calcareous rocks in the great western valley between the dark blue mountains and . . . in the woods of Augusta County." Mark Catesby. The Natural History of Carolina, Florida, and the Bahama Islands. 2 vols. London: Printed for B. White, 1771. Born in England, Mark Catesby lived in Virginia from 1712 to 1719, during which time he befriended William Byrd of Westover, John Clayton, John Bartram, and other important New World naturalists. 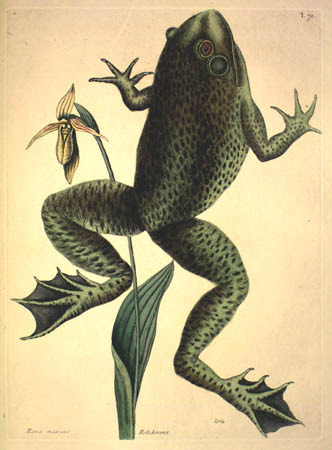 Upon his return to England he learned etching and produced the two hundred color plates of his Natural History, which he presented to the Royal Society in two volumes, in 1732 and 1743. An appendix, with 20 plates, appeared in 1747. As Catesby notes in the introduction to his Natural History, in 1714 he "traveled from the lower part of St. James's river in Virginia to that part of the Appalachian mountains where the sources of that river rise." Featured on this plate are the Cardinal (Richmondena cardinalis cardinalis), the fruit of the Mockernut (Carya tomentosa), and the Bitternut (Carya cordiformis), which Catesby refers to, respectively, as the Red Bird, the Hiccory Tree, and the Pignut Tree. This plate is the principal basis of the binomial Loxia cardinalis, used by Linnaeus to describe the Redbird in his Systema Naturae (1758). Pictured are the Bullfrog (Rana catesbiana) and the Yellow Lady-Slipper (Cypripedium calceolus). The most lasting living memorial of Catesby, the Bullfrog was named after him by the English naturalist George Shaw in 1802. This plate was issued in 1738, the same year what Catesby calls "the Ladies Slipper of Pensylvania" flowered in Peter Collinson's garden from propagate sent to him from Pennsylvania by John Bartram. André Michaux. Journal of Andre Michaux, 1787-1796. Ed. Charles Sprague Sargent. Offprint of Proceedings of the American Philosophical Society 26 (1889). Accompanied by his son François André (who would later produce The North American Sylva, 1817) and a servant, French botanist André Michaux traveled through the Valley of Virginia in July 1789, despite news of the April Riots in Paris. Not easily distracted by sublime spectacles, Michaux notes merely that he visited "a natural arch of 300 feet high," but he describes his botanical specimens in detail. Luigi Castiglioni. Viaggio Negli Stati Uniti dell' America Settentrionale, fatto Negli Anni, 1785, 1786, e 1787. Vol. 1 of 2 vols. Milano: Stamperia di Giuseppe Marelli, 1790. McGregor Library. A native of Italy, Luigi Castiglioni spent two years in America, hoping to "investigate the nature of the most useful plants, the manner of cultivating and propagating them, and the uses that are made or can be made of them." The journal of his trip, published in 1790 as the Viaggio, details his travels north into Charlottesville, west over the Blue Ridge into Staunton, and north through the Shenandoah Valley toward Winchester. William Bartram. Travels through North and South Carolina, Georgia, East and West Florida, the Cherokee Country, the Extensive Territories of the Muscogulges, or Creek Confederacy, and the Country of the Chactaws. Philadelphia: Printed by James and Johnson, 1791. Being now arrived on the South border of Virginia, and the hoary frigid season far advanced, I shall pass as speedily as possible from hence to Pennsylvania, my native country; since those cultivated regions of Virginia and Maryland, through which I design to travel, have been over and over explored, and described by very able men in every branch of natural history. John James Audubon. Ornithological Biography. Vol. 1 of 5 vols. Philadelphia: J. Dobson, 1831-39. John James Audubon. Birds of America. Vol. 1 of 7 vols. New York: J. J. Audubon, 1840-44. Published between 1827 and 1838 in England, the Elephant Folio of Audubon's Birds of America contained 435 life-size bird paintings, but little text, largely because English copyright law required the deposition of free copies of any publication containing substantial text in four national copyright libraries, a prohibitively costly proposition. As a result, Audubon wrote a five-volume companion text called the Ornithological Biography in collaboration with William MacGillivray, a Scottish naturalist. A revised version of this text was then incorporated into the smaller, octavo edition of the Birds of America published from 1840 to 1844. This particular volume of the Ornithological Biography was one of five copies Audubon sent in 1832 from Edinburgh to establish a copyright in America. In his discussion of the Eastern Phoebe, which appears in both the Ornithological Biography and the octavo edition of the Birds of America, Audubon describes encountering the bird at Virginia's Natural Bridge.